Yesterday I ran a half marathon in Bend, Oregon, so I’m going to keep it a little lighter. I trained a lot using this excellent free program from Hal Higdon. Because the results were posted in a nice simple table, I thought I’d do a few visualizations to see how well I did in addition to answering some other questions. 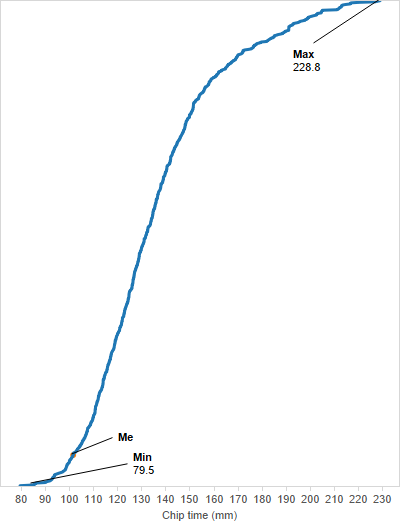 Below is a simple graph showing the result in minutes by each individual. I highlighted myself in orange. This was a very good time for me, and all the Hal Higdon speed workouts were a huge factor in getting me there. Because I’m closing in on 40, I do feel my own mortality. But I also want to achieve faster times in the future. 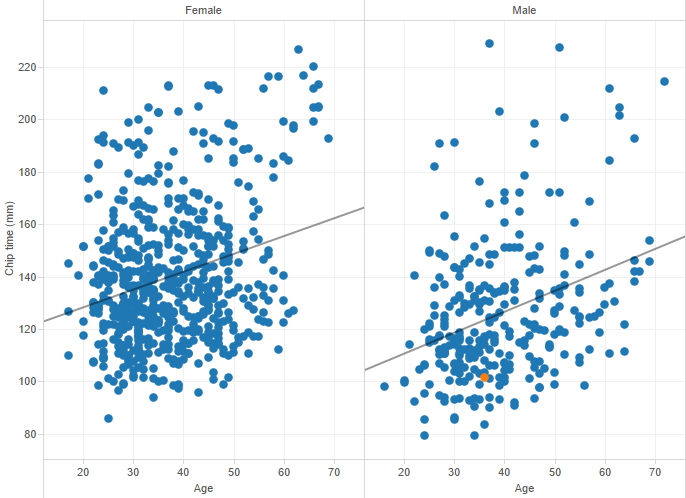 To figure out how doable this is, I split out men and women into two scatter plots. Below is a simple age vs. time. There certainly is a correlation: older people run more slowly. 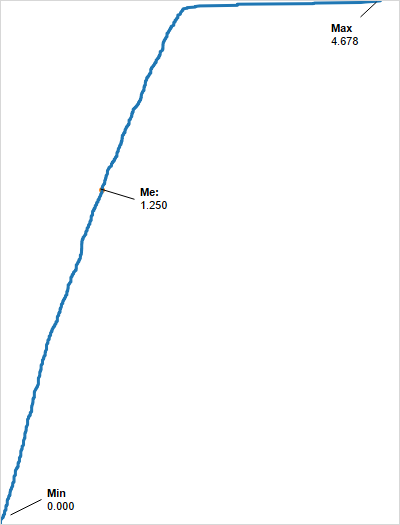 But r-squared isn’t terribly high (so the trendline doesn’t explain the points that well). I take solace that there were racers around my age and older who were significantly faster than me. For a look by division, the below graph let’s us compare both individuals within a group and groups between each other. Happily, I finished near the top of my group. One interesting new technology in races is that, when you start, you run over a speed bump that activates a chip in your bib. Because I wasn’t expecting to do terribly well, I was more relaxed about staying towards the back of the crowd and then passing folks during the first couple miles of the race. Did I suffer? My clock time did suffer more than most, but I certainly wasn’t the last person to cross the starting line. One person crossed almost five minutes after the race began. However, without a chip, I would have lost a few places (and 1 minute 15 seconds) just by waiting for the crowd in front of me. The chip time vs. clock time made me wonder if the more hard-core competitors clamored towards the front of the line. Based on the below scatter plot, they did. 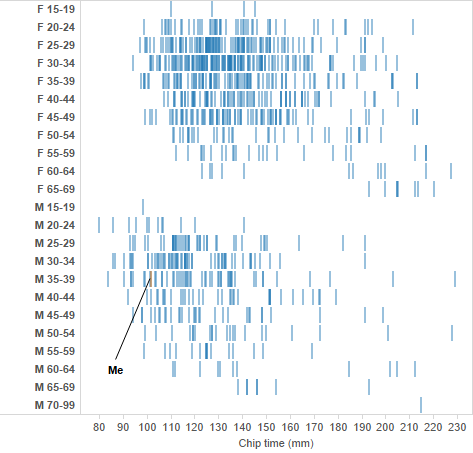 The faster the time, the lower the clock minus chip duration. 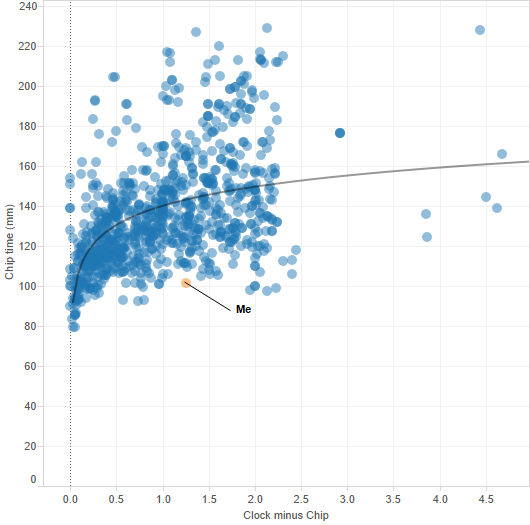 Because I stayed at the back and finished far better than I expected, in this graph I’m an outlier. Only four of the 919 participants started after me, but finished with a faster time. This week promises to be quite busy. I’ll try to keep blogging ever day, but may need to skip a couple. Do feel free to comment and question, as always.